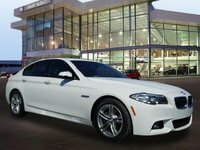 CarGurus has 1,130 nationwide M5 listings starting at $8,200. Rumor has it that the much-anticipated next-generation BMW M5, equipped for the first time with all-wheel drive (AWD), will make its appearance sometime in 2016 for the 2017 model year, or possibly in 2017 for the 2018 model year. These sorts of things are notoriously hard to predict, and only the automaker knows for sure when the new M5 will actually arrive. Until then, aficionados of the venerable M5 will have to make due with the current version, which is not a bad thing. In fact, the 2016 M5 offers just about everything you'd want in a truly capable and good-looking sport sedan--except, of course, AWD. If you're looking for AWD and are unwilling to compromise, you might want to wait another year or two and see what happens. Otherwise, jump in now and enjoy the fun. The M5 celebrates its 30th anniversary in 2016, and for all three decades it's thrilled those lucky enough to get behind its leather-wrapped sport steering wheel. Upon its debut, the M5 was the fastest production sedan available to car buyers. Although its top speed was electronically limited to 156 mph, it was capable of hitting speeds of up to 186 mph. Since then, the M5 has gone through a number of incarnations. The current fifth generation dates back to 2011, when it was unveiled in Frankfurt for the 2012 model year. The 2016 version of the 4-door, 5-passenger M5, representing the tail end of the fifth generation, receives only a few minor updates as it awaits more extensive revisions. Enhanced USB and Bluetooth, with an additional microphone and Bluetooth sync for a second phone, become standard, as does a power trunk lid with remote control operation. The automaker also offers a new Tanzanite Blue Metallic exterior color to replace Pyrite Brown Metallic. Other than that, the M5 rolls into 2016 unchanged. This means that the M5 retains its twin-turbocharged 4.4-liter V8 engine, which it shares with the M6 Convertible, as well as the X5 M and X6 M crossover vehicles. The turbocharged V8 pumps out an impressive 560 hp and a peak torque of 500 lb-ft at rpm as low as 1,500. With all that power under the pedal, the M5 jumps from 0-60 in just 4.2 seconds and to 124 mph in about 13 seconds. Independent testing puts the 0-60 time as low as 3.7 seconds. That's pretty fast, and has helped the M5 establish its reputation as the street racer to beat. BMW currently limits the M5's top speed to 155 mph. The V8 links to a 7-speed M double-clutch transmission, designed to handle the engine's high horsepower and torque. The transmission offers automatic and manual-shift modes and includes steering-wheel-mounted paddle shifters. For a more visceral driving experience, buyers can opt for an available 6-speed manual transmission. The V8 manages fuel economy numbers of 14 mpg city/20 highway, and premium fuel is required. Buyers seeking additional power can opt for a Competition Package, which boosts horsepower by 15, to 575. The Competition Package also adds a modified exhaust system with a unique engine note, exclusive 20-inch wheels, a modified steering ratio, black chrome tailpipes, and a specially designed suspension which lowers the car by 10mm. In its standard configuration, the rear-wheel-drive M5 rides on an M-Specific chassis and suspension system with an Active M rear-axle limited-slip differential, which works with the car's Dynamic Stability Control to provide greater traction and stability while cornering. The suspension also includes electro-hydraulic M Dynamic dampers and reinforced mountings, which distribute forces evenly around the body structure. A Driving Dynamics Control system offers Comfort, Sport and Sport+ ride settings, each delivering a progressively tighter feel with better feedback. Variable-assist M Servotronic power steering provides precise handling, while 19-inch forged alloy wheels with performance tires ensure good road grip. In addition to its engine note, the M5 to continues to make its presence known with a number of distinctive exterior design elements. These begin up front with the prerequisite dual-kidney grille, dressed up in an M-design with aggressive black double slats that mimic the double-spoke design of the wheels. The muscular hood retains its V-shaped lines, while the large black-screened lower air intakes channel airflow to the engine compartment. LED HID headlights include auto-leveling and headlight rings. Side air intakes, flared wheel wells, an M rear spoiler, L-shaped LED taillights, and M quad tailpipes provide additional visual appeal. Other standard features include heated power-adjustable side mirrors with auto-dimming and retractable rain-sensing windshield wipers. The M5's driver-oriented cabin features high-quality materials, an attractive, upscale design, and plenty of room for passengers. To distinguish it from the base 5 Series, BMW equips the M5 with a number of M-specific features, such as 20-way power-adjustable M multi-contour sport seats with side bolsters and memory, an M-specific instrument cluster, and a 3-spoke leather-wrapped M sport steering wheel. Leather upholstery, an Anthracite headliner, and aluminum trim also contribute to the upscale feel. Tech features include an iDrive controller with programmable buttons and a 10.2-inch color display. The iDrive system integrates a navigation system, a 200GB hard drive, a rear-view camera, and a 16-speaker 600-watt harmon kardon audio system with HD radio. A power moonroof, automatic climate control, remote keyless entry, and ambient lighting are also included. Some reviewers find the 14-cubic-foot trunk small for the M5's class, but 60/40-split fold-down rear seats with a pass-through help expand cargo capacity. All the regular safety features are present, including a full range of airbags, dynamic traction control, and antilock brakes with dynamic brake control and cornering brake control. Optional safety features include blind spot detection, lane departure warning, and a forward collision warning system. Competitors to the M5 include the Audi S7, the Cadillac CTS-V sedan, the Jaguar XFR, and the Mercedes-Benz E63 AMG sedan--but the M5 remains at or near the top of its class. What's your take on the 2016 BMW M5? Users ranked 2016 BMW M5 against other cars which they drove/owned. Each ranking was based on 9 categories. Here is the summary of top rankings. 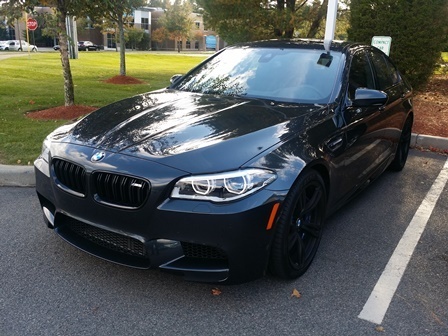 Have you driven a 2016 BMW M5? Carbon Ceramic Brake Swap On '16 M5?